Am bliadhna bha mi ag obair sna làithean-saora mar neach-iùil do luchd-turais a ruigas port Inbhir Ghòrdain sa Ghàidhealtachd air na loidhnearan ana-mhòra a bhios a’ dèanamh chuairtean-mara timcheall air Breatainn no suas gu Nirribhidh. Gu tric chan eil ach aon latha a-mhàin aca gus a’ Ghàidhealtachd fhaicinn agus bi busaichean a’ feitheamh orra sa phort agus iad a’ dèanamh chuairtean eadar-dhealaichte tron sgìre: do chaistealan agus gàrraidhean, do thaighean-staile agus raointean-goilf, agus – tha fhios – do Loch Nis. Ach chaidh na buidhnean agamsa, Gearmailtich gu ìre mhòr, do Chaisteal Chaladair agus Cùil Lodair. Bha iad uile uabhasach measail air a’ chaisteal bhòidheach agus air na gàrraidhean brèagha timcheall air, ach rinn Cùil Lodair druidheadh sònraichte orra. Bha ùidh dhùrachdach aig mòran dhiubh anns an eachdraidh (air neo bhiodh iad air diofar seòrsa cuairt a thaghadh) agus chuir iad iomadh cèist chiallach. Gu tric bha dealbh den bhlàr aca, agus den eachdraidh Albannach aig an àm sin, gu math dubh-geal roimhe – Albannaich an aghaidh Shasannach, no Caitligich an aghaidh Phròstanach, agus bu mhòr an iognadh nuair a chuala iad gun robh Albannaich (agus Sasannaich, is Frangaich, is Èireannaich agus fiù ‘s Gearmailtich) air gach taobh. Gum b’ e seòrsa cogadh catharra a bh’ ann. 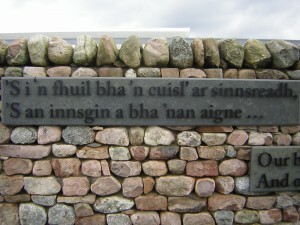 Agus cha robh e soilleir idir dhaibh roimhe dè a’ bhuaidh chronail mhairsinneach a bheireadh e air dualchas is cùltar na Gàidhealtachd agus na h-Alba gu lèir. Agus bha cuimhn’ agam an uair air a’ chiad turas a bha mi fhìn san ionad-tadhail ùr an sin, o chionn sia bliadhna. Podcast: bho mu 23 mionaidean a-mach. Anns an Lùnasdal sa chaidh bha mi a’ chiad thuras ann an Ionad-Tadhail ùr Chùil Lodair faisg air Inbhir Nis, barrachd air 260 bliadhna às dèidh a’ bhlàir fhèin 16 den Ghiblean 1746 – am blàr mu dheireadh air talamh Bhreatainn. Mar a thathar a’ ràdh air làrach-lìn an Ionaid: ‘Pàirt de chòmhstrì creideimh agus poileataigs nas motha san Roinn Eòrpa, dh’atharraich am blàr goirid ach fuilteach cùrsa eachdraidh’. Tha an Ionad a’ feuchainn sealladh dhuinn le meadhanan beothail ach fiosrachail carson a thachair am blàr agus na thachair dha na daoine an sas ann fad nan làithean cruaidh seo – nam bheachdsa glè shoirbheachail. Tha an togalach fhèin gu math ìosal is soilleir, freagarrach do chumadh na tìre, dhan mhonadh lom timcheall air. 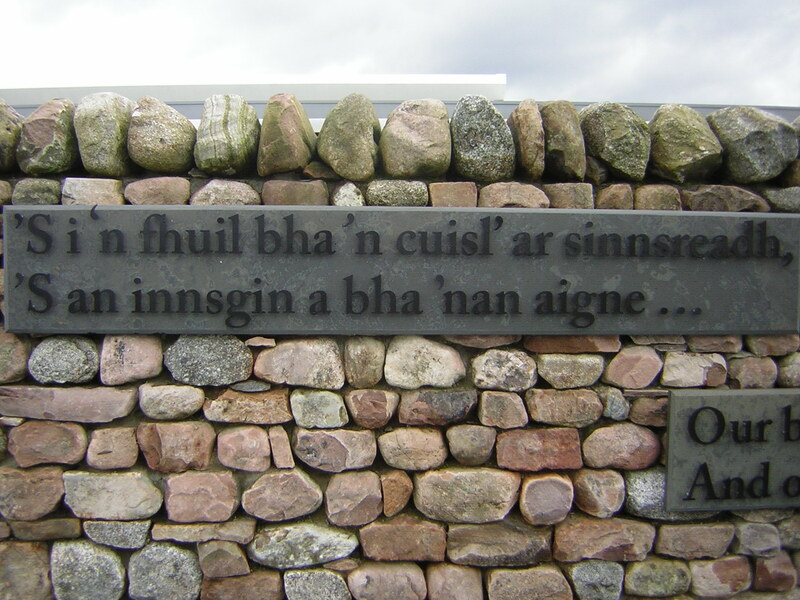 Ach taobh a-staigh tha taisbeanaidhean ùra uabhasach tarraingeach druidhteach, le cothrom anns an ‘teàtar-bhogaidh’ a bhith a’ faireachdainn co ris a bha e coltach a bhith an làthair ann an teas-mheadan a’ bhlàir neo-ionnan seo, eadar gunnaichean mòra agus claidheamhan, agus a’ ghleadhraich is an sgreuchadh timcheall ort – faireachdainn nach dìochuimnhnich thu cho luath. A-muigh air a’ mhonadh bha e grianach; bha am feur fada bàn, is dìtheanan samhraidh na mheasg, nas coltaiche ri lòn àibheiseach na raon fuilteach blàir, ach bha faireachdainn anabarrach ann, ’s dòcha leis a’ ghaoth fhionnar a bh’ ann, ach ma dh’fhaodte air sgàth nam brataichean-rèisimeid sgapte, agus a’ Chàirn-Chuimhne. Faodaidh tu inneal-làimhe claistinneach a thoirt leat anns a’ mhonadh le fiosrachadh beothail mu gach àite, ach b’ fheàrr dhomhsa a bhith dìreach a’ coiseachd mun cuairt, a’ gabhal a-steach an spioraid bhrònaich. Bho mhullach an Ionaid chithear am blàr gu lèir agus às dèidh dhut faighinn a-mach mar a bha an sabaid, tro thaisbeanaidhean lèir-chlaistinneach agus ‘luchd-fianais’ am broinn an Ionaid, ’s urrainn dhut na tachartasan oillteil an latha sin a dhealbhadh ach ro mhath. 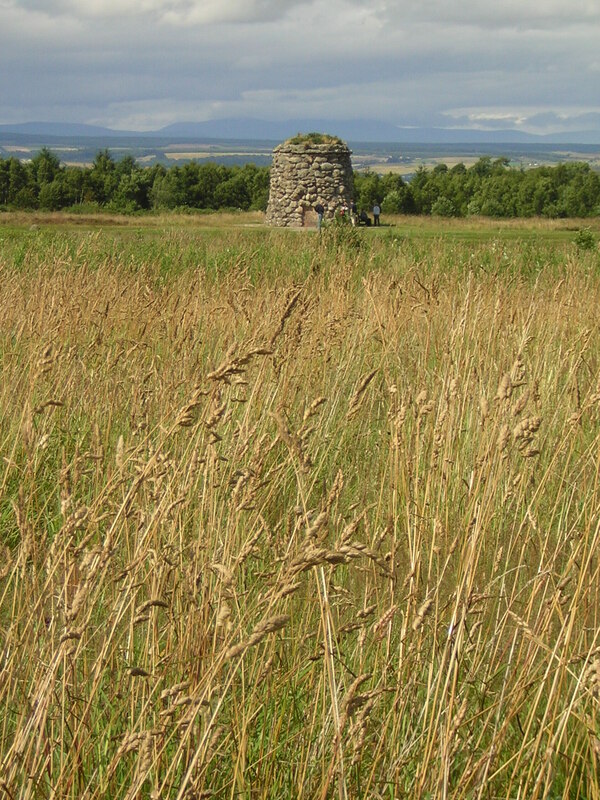 An uair sin bha sinn toilichte a dhol a-steach dhan chafaidh mhòr shoilleir, far a bheil (coltach ri sna taisbeanaidhean uile) soidhnichean dà-chànanach anns gach àite – samhla dòchasach gum bi ar cànan – aon uair cho ceannsaichte – beò fhathast, agus a’ tighinn mu dheireadh thall às an sgàil a’ bhlàir, nam Fuadaichean, is ar eachdraidh nas ùire. This year in the holidays I worked as a tour-guide for passengers from the enormous cruise-ships which call at Invergordon on their voyages round Britain or up to Norway. They usually only have one day to see the Highlands and buses are waiting at the harbour to take them on various tours around the area, to castles and gardens, to distilleries and golf-courses, and – of course – to Loch Ness. But the groups I had, mainly Germans, were going to Cawdor Castle and Culloden. 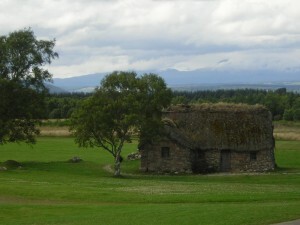 They were all very taken with the pretty castle and its lovely gardens, but Culloden made a special impression on them. Many had a genuine interest in history (otherwise they’d have chosen a different tour) and asked lots of intelligent questions. 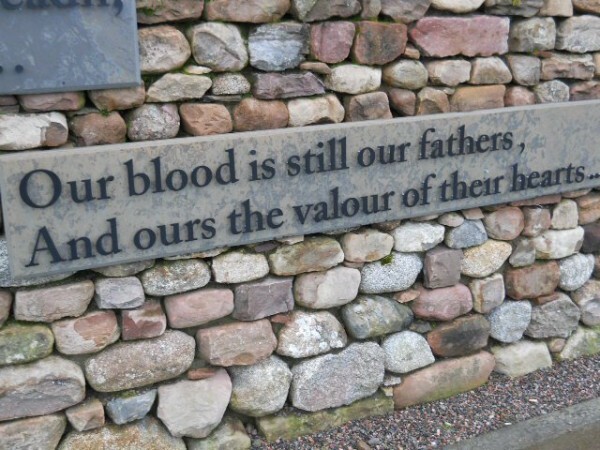 Often they came with a very black and white idea about the battle and and about the history of the time – Scots against English, or Catholics against Protestants, so they were very surprised when they heard that were were Scots (and English, and French, and Irish, and even Germans) on both sides. That it was actually a kind of civil war. It had alos not been clear to them before what a damaging and lasting effect it had on the heritage and culture of the Highlands, and Scotland as a whole. 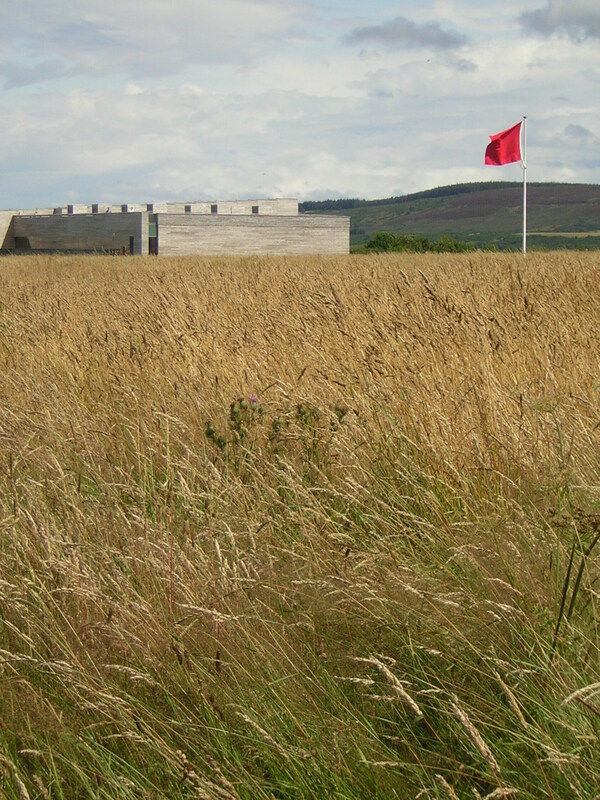 And I remembered my own first visit to the new Culloden centre 6 years ago…. Podcast: from about 23 minutes in..
Last August I visited the new Culloden Visitors Centre for the first time, more than 260 years after the battle on 16 April 1746 – the last battle on British soil. As the Centre’s website says: ‘Part of a wider European religious and political conflict, the short but bloody fight changed the course of history’. The Centre tries to show us – I think very successfully – through lively but informative media why the battle came about and what happened during those cruel days. 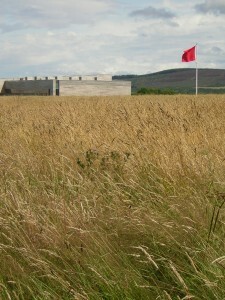 The building itself is low and light, adapted to the shape of the land and the bare moor around it. Inside there are fascinating and moving new displays, with the chance to experience in an ‘immersion theatre’ what it was like to be in the middle of that unequal battle, between the cannons and the claymores, with the clamour and the screaming all around you – an experience you won’t forget in a hurry. Outside on the moor it was sunny. 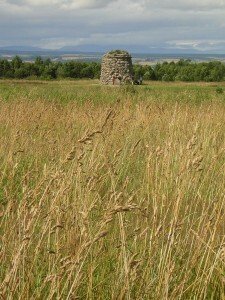 With the long pale grass dotted with summer wildflowers, it looked more like a vast meadow than a bloody battlefield, but there was a curious atmosphere, maybe because of the chill in the breeze, but more likely because of the regimental flags scattered around, and the memorial cairn. You can get a portable audio device that gives you information wherever you go on the moor, but I preferred just to walk around and soak up the melancholy atmosphere. From the roof of the Centre you can see the whole battlefield, and having learned all about the fighting from the audio-visual displays and the ‘witnesses’ in the exhibition, you can imagine the horrific scenes on that day only too well. 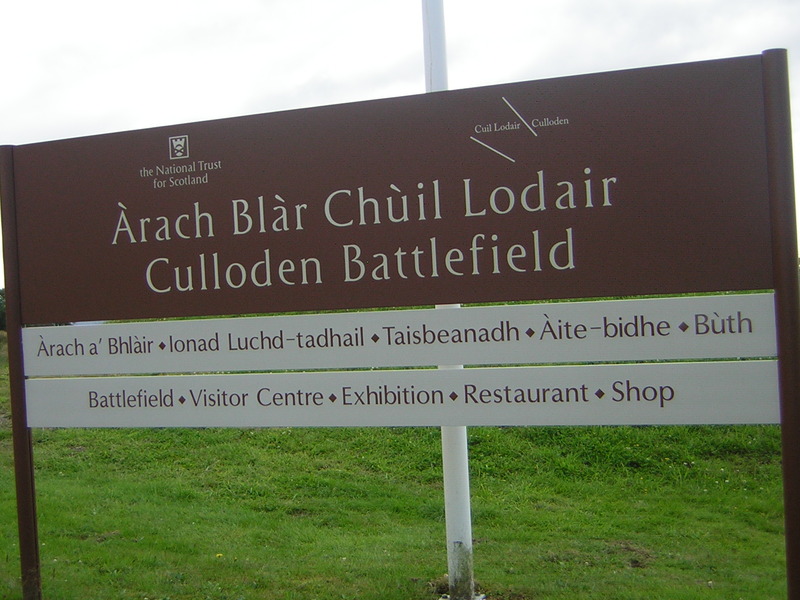 After that we were glad to go into the large, light café, where there were – as throughout the exhibition – bilingual signs everywhere, a symbol of hope that our once so repressed language is still alive and finally coming out of the shadow of the battle, the Clearances and our more recent history. Mòran taing do Linda W. airson na deilbhe seo!